The Monroe Library Friend of the Month for November is Enara Iturrioz! Enara is an exchange student from San Sebastián in Basque Spain who is studying Law and Business Administration. Enara spent the semester at Loyola as part of an exchange program through ICADE (Instituto Católico de Administración y Dirección de Empresas) Madrid. She has one more semester left at ICADE, and after graduation, Enara plans on either continuing her studies in the United States or finding a job in Europe. Enara uses the library to study and to do research. She utilizes many of the Monroe Library’s resources including computers, laptops, study rooms, and DVD checkouts. She especially likes the different qualities of the library’s three floors: Enara uses the first floor for group work, does homework on the second floor, and studied for finals on the third floor. Enara said that she loves the Monroe Library because everyone is kind and helpful. “It makes me feel like home. Knowing that you are in a caring environment makes me feel satisfied!” said Enara. Thank you for using the Monroe Library, Enara, and congratulations on being our Friend of the Month! As Loyola’s students finish up their exams and head home for the holidays, let us take a look at Loyola’s Christmas Past. Should we revive any of these old traditions? 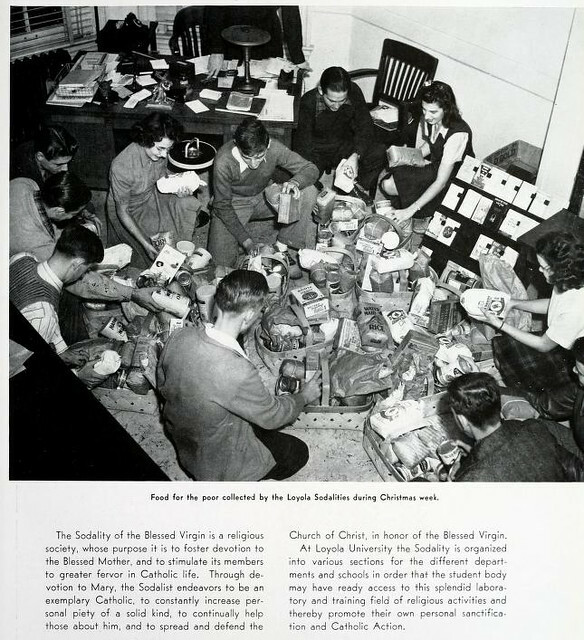 In 1943, at the height of WWII, campus groups were collecting food for the poor at Christmastime. 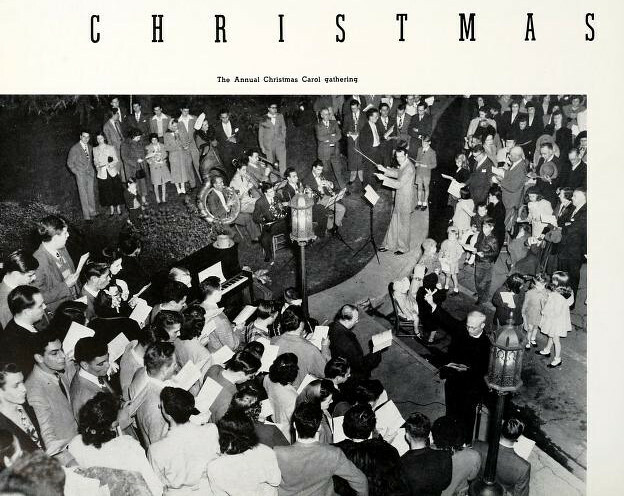 In 1949 community members as well as university students, staff, & faculty gathered to sing carols on campus. 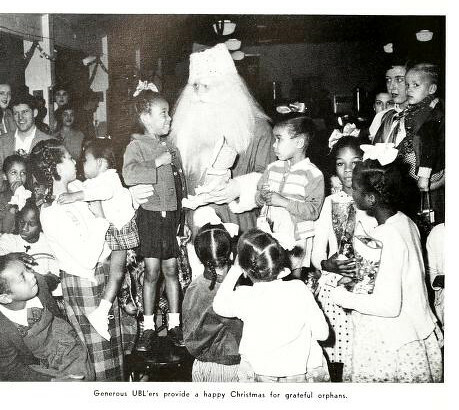 In 1951 Upsilon Beta Lambda held a Christmas party for local orphans. 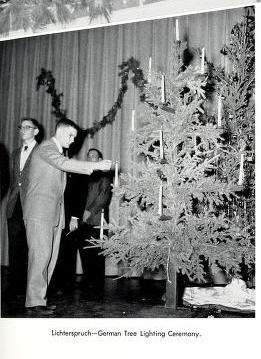 In 1959 Loyola’s German Club put on a traditional German Christmas party, complete with a Christmas tree! 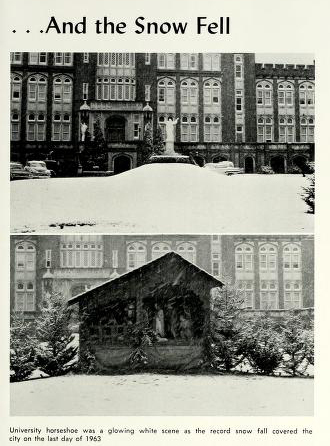 To cap it all off, in 1964 the university almost saw a white Christmas as snow blanketed the manger scene in the horseshoe on December 31. 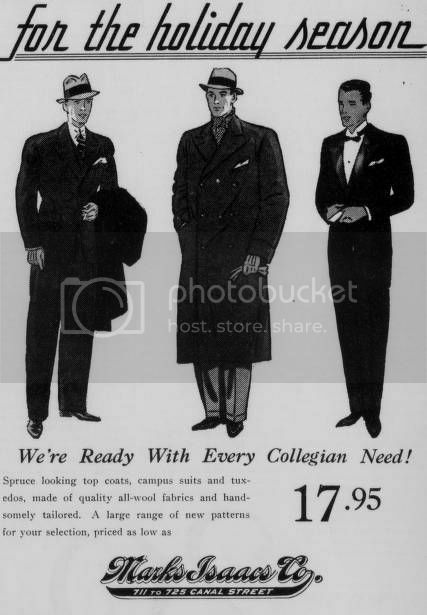 What did the stylish Loyola man wear to celebrate the holidays in years past? 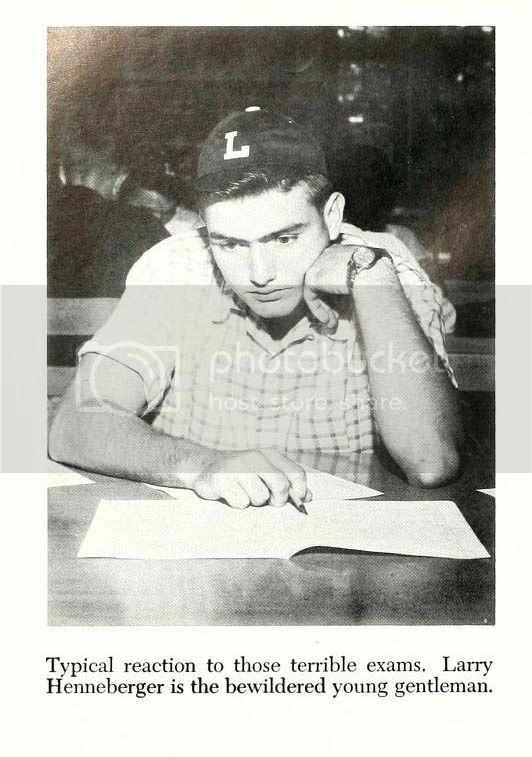 The online archive of The Maroon has the answers. 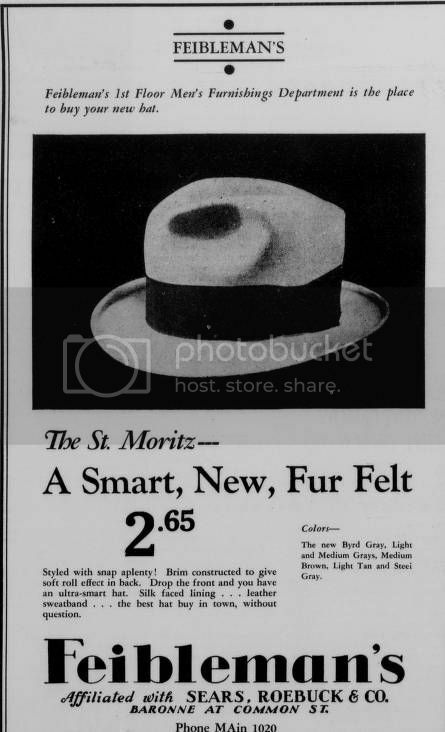 No outfit is complete without a spiffy hat. Sometimes, you want to be casual. But still stylish, of course. The library is packed full of students now that finals have started. While the stress of getting through exams may seem fresh every semester, Loyola students have been studying their way to winter break since the university was founded in 1912. 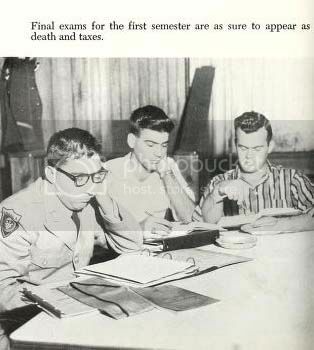 Take inspiration from these students from the past, and good luck! 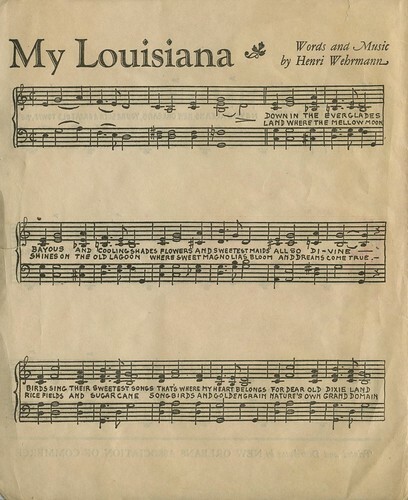 A recent donation to the Monroe Library Special Collections & Archives included several pieces of sheet music written about Louisiana and New Orleans. Go ahead and sing along! 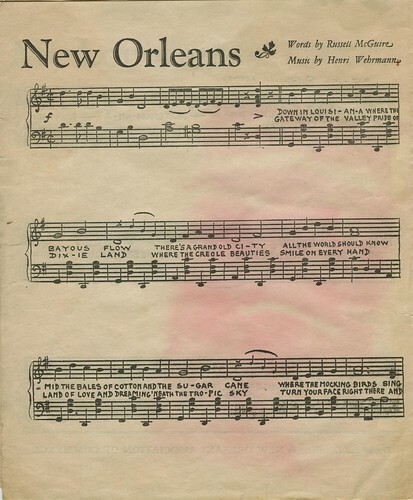 The sheet music was part of an additional donation from Anthony J. Stanonis, a Loyola history graduate and author of several books and articles on New Orleans and Louisiana history, including Creating the Big Easy: New Orleans and the Emergence of Modern Tourism, 1918-1945, and Through a Purple (Green and Gold) Haze – New Orleans Mardi Gras In the American Imagination. 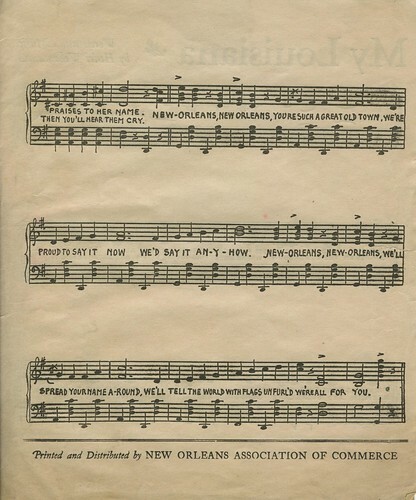 In 2004, Mr. Stanonis donated much of his research material for his book on New Orleans tourism, which included guides, maps, brochures, booklets, and other literature put out by local public and private groups and businesses, spanning roughly from 1902 to 1960. This collection is an invaluable resource for studying the growth and development of the tourism industry in New Orleans. Many of the pamphlets can be viewed on the Louisiana Digital Library. The Residence Hall Association has partnered with the library to provide free snacks during finals. Fruit, bagels, energy bars, and other healthy treats will be served by your RHA representatives in the library at midnight on Sunday, December 8 through Wednesday, December 11. Thanks for your generosity, RHA! For many of us, the holidays mean fancy food and drink. 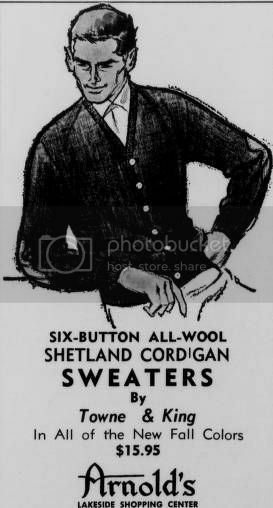 For your cold-weather (?) libation needs, look no further than Special Collections & Archives for a recipe for a delicious treat. In 1896, antiques dealer Waldhorn Co. published a small advertisement called “Antiques: A rare collection from old Creole families.” The tiny pamphlet includes poetry by Eugene Field and Mrs. M.E.M. Davis as well as an ode to a drink called Café Brûlot by James A. Morosa. 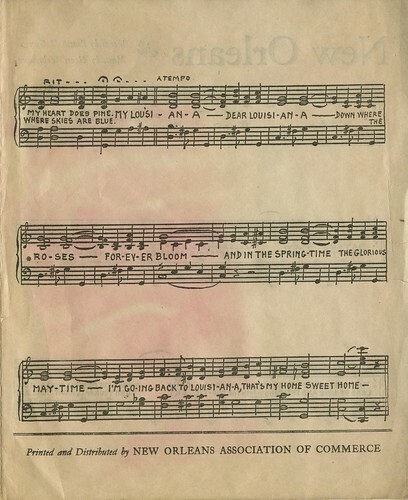 Morosa was inspired to write the verse after sampling a concoction made by Dorothy Dix, one of the first advice columnists and an employee of the New Orleans Daily Picayune. The drink is a spiced mix of brandy and coffee–perfect for warming up on a chilly winter night. Café Brûlot Diabolique (Devilishly Burned Coffee), as it is formally called, was developed by Jules Alciatore, proprietor of Antoine’s Restaurant, in the 1890s. View the entire pamphlet in the Louisiana Digital Library or come to Special Collections & Archives to see it in person. The video computer training service lynda.com is now at the Monroe Library! It has over two thousand videos on audio, business, CAD, design, photography, video, and the web, like using Pintrest for your band or personal branding basics. You’ll find how-tos for all Microsoft Office components, as well as software from companies like Adobe. There is a single workstation with lynda.com in Monroe Library Room 109. The key for this room can be checked out at the Learning Commons Desk on the first floor, or reserved in advance by contacting Jason Ezell at 504-864-7138 or jezell@loyno.edu. Questions go to Jim Hobbs at hobbs@loyno.edu or 504-864-7126. The Monroe Library Learning Commons Student Employee of the Month for November is Starlight Williams! Starlight is a freshman from Douglasville, Georgia, and is majoring in Journalism and Pre-Med. Starlight is active on campus as an editorial assistant for the Maroon, a Loyola Ambassador, and a member of the Residence Hall Association’s Campus Programming and Service & Community Advocacy Committees. Congratulations, Starlight, and thank you for all of your hard work! Today’s edition of #minibookmonday showcases The Life and Exploits of Robin Hood. This small book, measuring only 3 X 5 inches, was published in London around 1860. The nineteenth century mass-market publisher of this work, Milner and Sowerby, reproduced classic works of literature on the cheap, using inexpensive paper and producing small, pocket-sized books that sold thousands of copies in their day. 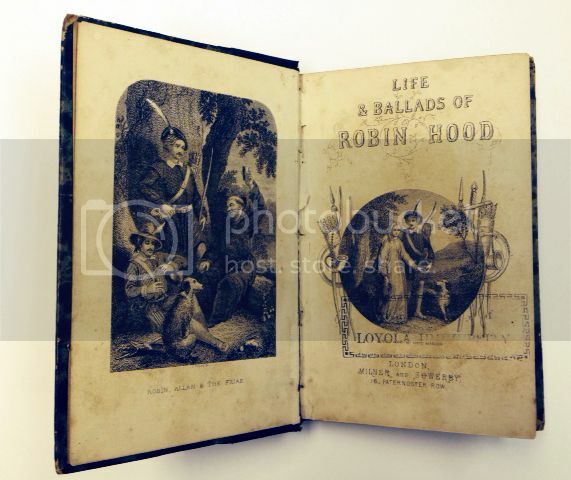 Perhaps due to their inexpensive, almost ephemeral nature, only a few copies of this small edition of The Life and Exploits of Robin Hood can be found in United States libraries today. The Monroe Library is one, so come and see this small swashbuckling tale for yourself! You are currently browsing the Library Lagniappe blog archives for the year 2013.